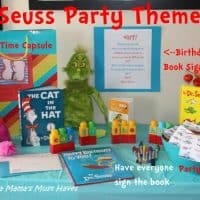 I’ve shared all of my Dr. Seuss Birthday party ideas with you and now by popular request I am sharing my Beezlenut Splash recipe with you. 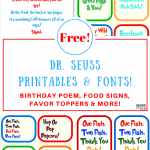 You can get the free Dr. Seuss printables for the label as well. Grab the free printable Beezlenut Splash label here. Add a Dr. Seuss character sticker to the label, affix it to a piece of cardstock and tape it to the beverage dispenser (this is the one I love )! Voila! 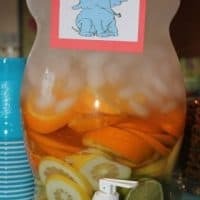 Beautiful drink for your party! 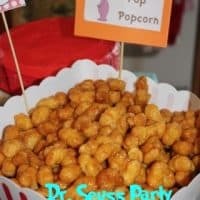 Beezlenut Splash Recipe for Dr. Seuss Party! Refreshing drink! Fill large beverage dispenser with oranges, lemons and limes sliced into large rings. There is no magical number for the amount of each fruit you add to the water. It will vary depending on the size of your container. I used a large batch of fruit which filled my jug 1/3 full. Be sure to add more oranges than lemons and only a few limes. Add ice and water and serve. As the water runs out simply refill. The fruit will continue to flavor the water. « Calling All Dinosaur Train Lovers! New DVD Big, Big, Big Hits Store Shelves! I love this! I love that it doesn’t take much prep time to make. Great for parties! 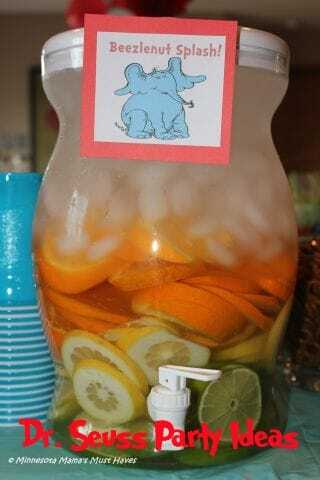 Easy and a great way for kids to drink water willingly. so pretty! I never would have thought of this for a party! 🙂 thanks! This is a really cute idea. What a great addition to any party!